Blue gemstones – reflecting all tones of the sky and sea — are positively stunning. They’re also widely believed to promote inner peace and enhance communication. The sapphire, and by extension sapphire blue, is thought to open blocked energy flow; counteract chaos; encourage calm; and foster wisdom, intuition and focus. And, who couldn’t use some help with that? Here are 5 ways to incorporate this exquisite color into your home – so you can open the flow of energy and communication and feel at peace every day! 1. Go Cool in the Kitchen: The bold use of blue in this bright kitchen creates a purposeful focal point and adds depth and interest to the room. It’s particularly striking against the hardwoods and the lighter blue wainscoting. According to HomeAdvisor’s True Cost Guide, you can hire a pro to paint your kitchen cabinets and range hood for around $300-$1,400. (The total cost will depend on your cabinets’ square footage.) If you’re not ready to commit to this level, consider a pop of sapphire in a backsplash. Or, incorporate some funky blue elements like these chairs. 2. Color Built-ins Blue: Like an accent wall, but oh-so-much more impressive. Blue built-ins provide a royal backdrop for your coolest things – and they’ll really make them pop too! There are a number of ways to style blue built-ins. Consider accessorizing them with curios in white or complementary shades of blue. Or, to add extra energy to the room, use colors opposite blue in the color wheel – colors like rusty browns and shades of yellow and orange. 3. Inspire at Entry: A sapphire front door will set the tone for your household, greeting you (and your guests) with the color’s peaceful, free-flowing energy every time your enter your home. According to HomeAdvisor’s True Cost Guide, you can hire a professional to paint your front door for $100-$300. Not bad, considering the positive impact it will have on both the curb appeal and the overall vibe of your abode. 4. 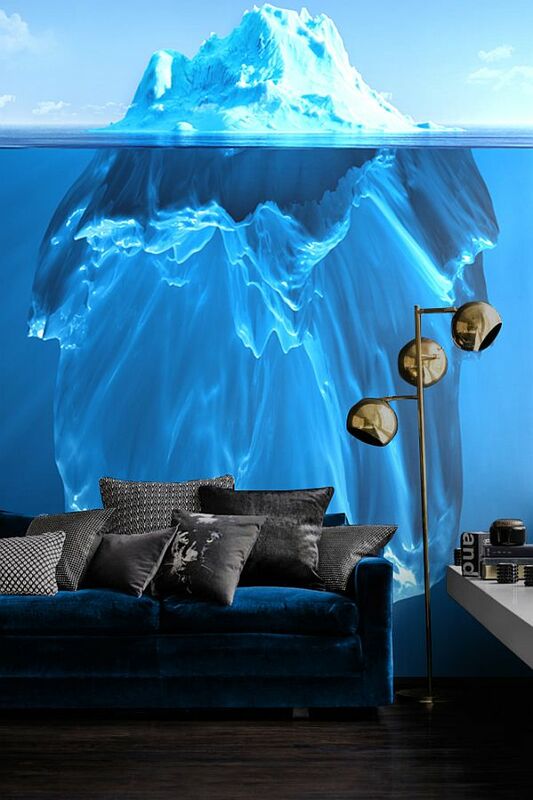 Work it on the Walls: This iceberg-inspired mural takes the incorporation of sapphire and other blue-beauty hues to a cool extreme. And while this is one striking way to do blue, you certainly don’t have to be this adventurous in your own execution. 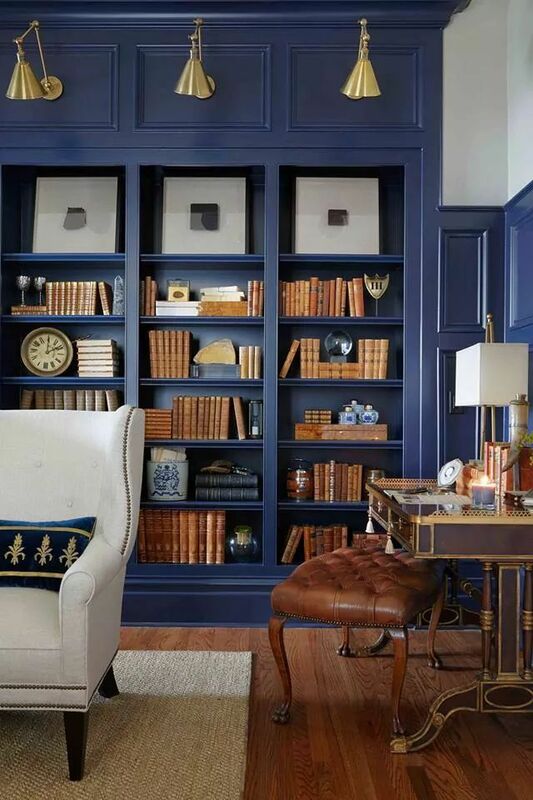 Painting a room a deep sapphire yields a rich and regal outcome. Or, a simple accent wall may be enough to do the color justice in your space. You might also consider a sapphire-inspired wallpaper in a pretty pattern or texture. 5. 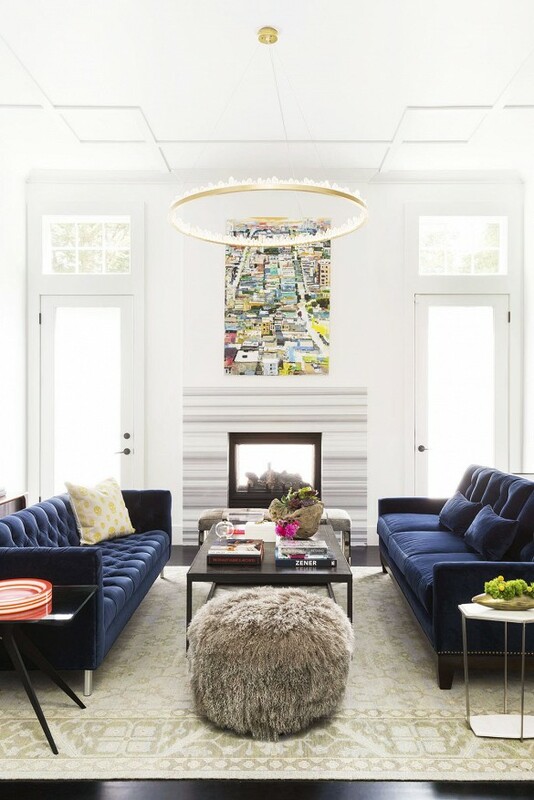 Toss in Some Sapphire Tones: If you’re not ready to go all-out with sapphire, toss in some subtle – or some not-so-subtle — accents in one room or throughout your home. Throw pillows and vases are a great way to experiment with a new color. Or, go even bolder with sapphire seating. These plush velvet couches give a cozy and imperial feel that perfectly complements this otherwise Spartan space.